Activities include: Displayed fossils from the museum’s vaults, special fossil quest, fossil puzzle, make your own trilobite mask and more. National Fossil Day is a celebration organized to promote public awareness and stewardship of fossils, as well as to foster a greater appreciation of their scientific and educational value. 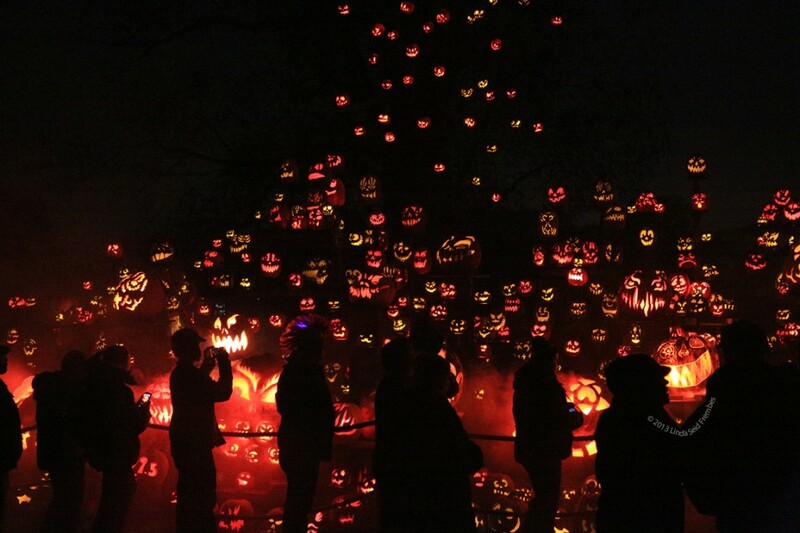 The Jack-O-Lantern Spectacular, presented by Citizens Bank, returns to Roger Williams Park Zoo nightly from October 6 – November 6. This breathtaking display of thousands of illuminated jack-o-lanterns features over 125 of the gourds carved into veritable works of art playing out this year’s theme “American Treasures.” And of course, Halloween favorites will be back including the dazzling Laughing Tree with its hundreds of illuminated pumpkins and iconic laughing music. New this year, Friday – Sunday nights now feature timed ticket entry starting at 5:30pm. These tickets will only be sold online. The Federal Hill Commerce Association will be hosting its Annual Columbus Day Weekend Festival on Atwells Avenue located on historic Federal Hill in Providence Rhode Island. This three day Italian festival attracts visitors from all across southern New England bringing people together for great food and entertainment and has been recognized as one of the best Columbus Day festivals to attend. This exhibition will feature the works of Nick Gebhart, Magdalena Slabosz and Judy Volkmann. • Nick Gebhart has always been interested in observing and converting what he sees into a two-dimensional representations. The people in his paintings are the focal point, and viewers are invited into the figures’ personal space; an invitation that seems uncomfortable, unknown or unwelcome. • Canadian-based Magdalena Slabosz is an oil painter who explores hedonism through portraiture. She captures people immersed in their surrounds, documenting the hedonistic practices of human beings in their most relaxed form while using dolls as a tool to reflect these practices. Each portrait explores the superficial nature of each face compared to the persona displayed in the expressions. • Judy Volkmann’s artwork depicts humanity, and how physical, emotional and societal influences shape us into who we are. The figures and portraits represented are often in states of being reflective, engaged, celebratory, or confrontational. When painting the figures, Judy’s aim is to capture movement, and the physical characteristics and psychological aspects of being human. A sense of place and time are purposely void; creating an atmosphere expressive of the internal and external world of being. Explore an intriguing assortment of 3-D design and construction challenges big and small! Build big Stick Structures from wooden dowels, rubber bands, fabric and other intriguing “loose parts.” Invent structures that are large enough to climb inside and construct a giant cube that stands up on its own! Also create Confection Constructions by connecting marshmallows and toothpicks, and join together spools and sticks to tackle clever Tinker Toy creations. Admission: Free with Museum admission of $9.00 per person; free for members. Procter elaborated further on his creative process by explaining that while most of his pieces are one off types, he is looking forward to experiment with duplicate pieces in preparation for the Blithewold showing. While very familiar with creating large pieces to be fired in his five-foot tall kiln, Procter is also excited to push boundaries in terms of vessel size. Proctors vessels marry ancient traditions with an elegant contemporary sensibility. The large scale of the pieces lends a sense of presence and spirit that makes them a powerful focal point in the garden. In this biting comic-drama, the estranged members of the Lafayette family return home to their run-down Arkansas estate after the passing of the family patriarch. As they sort through a lifetime of mementos, they discover a gruesome relic that turns their reunion into an escalating series of shocks, showdowns and revelations. Winner of the 2014-2015 Obie Award for Best New American Play, Appropriate is–on the surface–an homage to the classics of the American theater canon. Look deeper into Branden Jacobs-Jenkins’ “remarkable and devious” (The New York Times) new play, though, and discover what familial ghosts await. On October 7th Alex Han Quintet and Four Agreements return to AS220, and with us we are bringing some incredible local musicians. Headlining the night we have Four Agreements. This quartet plays with superb virtuosity that is seldom matched by any other group we see – especially as they continue to grow as a unit – and that have always been a welcome sight for our series. Formed initially as a weekly jam by a group of friends, this unique and exciting band features Clay Nordhill on guitar, Tom White on keyboards, Sam Kurzontkowski on bass, and Paul DiMartino on drums. The group uses original compositions as a vehicle to explore possibilities in sound and communication. Opening the evening will be the Alex Han Quintet who are a group of Brown University undergrads from various musical backgrounds. Coming together in Brown’s vibrant jazz community, these musicians integrate hip-hop, neo-soul, and fusion while staying rooted in the jazz tradition. This group will feature original compositions in a genre-bending performance. They present an eclectic fusion of sounds and styles that we’ve been eager to host at the series, you have to tune in for these inspiring players. As is the standard, the music begins at 9pm with tickets being a meager $10 for an incredible night of sound to end your week. Do you have a schedule of events for the upcoming season(2017)?